What the message in flespi includes and how to access it. Note: Symbols '#', '+', '/', ':' are not allowed in idents. channel.id — the ID of a channel handling the connection. protocol.id — the ID of a protocol channel is configured to work with. All other message parameters depend on the device protocol, type, and configuration. The full list of parameters accepted by channel operated over specified protocol can be found in appropriate protocol page, e.g. https://flespi.com/protocols/teltonika#parameters. The naming of message parameters is unified, it means that parameters with the same meaning received from different trackers over different protocols will get identical names and measurement units in flespi. The full list of parameters supported by flespi can be retrieved via an appropriate API call. A message is represented by the plain JSON object with parameter names as keys. HTTP REST API call — get messages from the channel’s internal buffer. Push-mode streams — flespi will push messages to the specified platform. 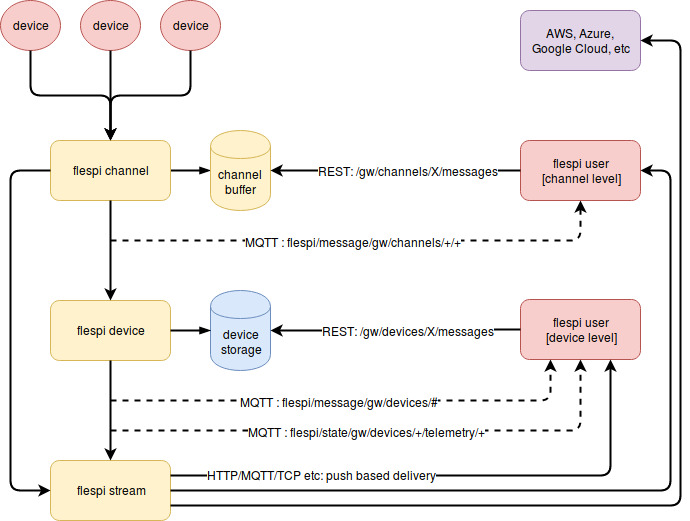 MQTT API — receive messages via MQTT client subscribed to the appropriate topic. To understand the message lifecycle in more details please refer to this article. The lifetime of a message is limited by the time-to-live parameter of the message buffer.